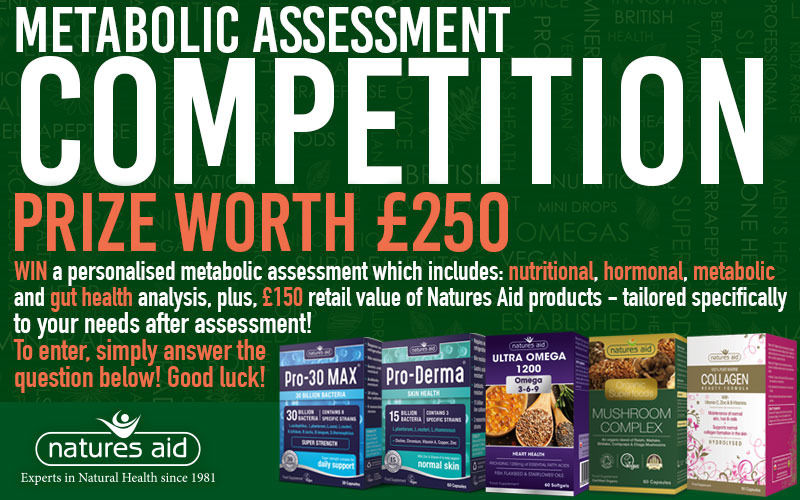 Natures Aid are giving you the chance to win a personalised metabolic assessment which includes: nutritional, hormonal, metabolic and gut health analysis, plus £150 retail value of Natures Aid products - tailored specifically to your needs after assessment! Two lucky winners will be chosen. Prize worth £250! To enter, simply read the passage below and answer the question correctly. Good luck! Natures Aid have been manufacturing and supplying high-quality nutritional supplements for more than three decades. Experts in natural health since 1981, Natures Aid has become one of the UK's favourite brands of vitamins, supplements and herbal products. Visit our website to find out more about us. Did you know that you have 100 trillion bacteria inside you? Inside each and every one of us is a huge collection of bacteria known as ‘The Microbiome’. The idea of all these bacteria living in us and on us may be enough to make the skin crawl, or send some people running to wash their hands(! ), but it is not possible to be a healthy human without them. A lot of research has been carried out recently, investigating these bacteria, and scientists have discovered that a healthy microbiome is essential for wellbeing in many different ways. Looking after the microbiome, by topping up with good bacteria, could therefore support us in ways not previously imagined. Now answer the question below for your chance to win!